Wife Persimmon & I spent the year of 2016 traveling around the country in our little red Jeep. As part of our sojourn, we determined to visit as many brewpubs / breweries as was feasibly possible with also taking advantage of friends welcoming response to our request for a friendly nights (or 3) stay. In return, we would happily perform any medial chores that were needed; cleaning dishes, vacuuming the pool, repairing or replacing the roof recently destroyed by Hurricane Mathew. We also made promises to those kind souls to buy a round of beers from their local, nearby brewery. In Orlando (after being gifted with 3 days of free access to Disney World by former employees!) we brought them to Orlando Brewing. An hour pasted way too quickly as the four of us downed Girl Scout Chocolate Mint after Peachy Queen after Mo'Mo Brown after Papa Midnight. Then a company Xmas party showed up with food and presents and since we were not part of that "club" we decided it was time to take our leave. But our ex-Disney-ites marveled at the good time they had, how they had wanted to do something "like that" for a long time and vowed not only to return but to visit more such places. Mission accomplished and 2 more beer-geeks-to-be can be welcomed into the fold. I got to check out Orlando Brewing when I was recently in town for work. Luckily, they're open late so there was plenty of time to pay them a visit after dinner. They're located in an industrial section of town. My GPS told me to turn down their road, and I wasn't too sure because it was blocked off by cones. I eventually found my way, but was still a bit skeptical even when I pulled up. Luckily, I was undeterred and had a good experience. The bartender was really friendly, and they have a good selection of beers. I tried the sampler of an Red, Brown, Scotch Ale, and a Pale Ale, and was given a free taste of the Oatmeal Stout. I felt the beers were a little light on flavor for my taste, but they were of good quality. 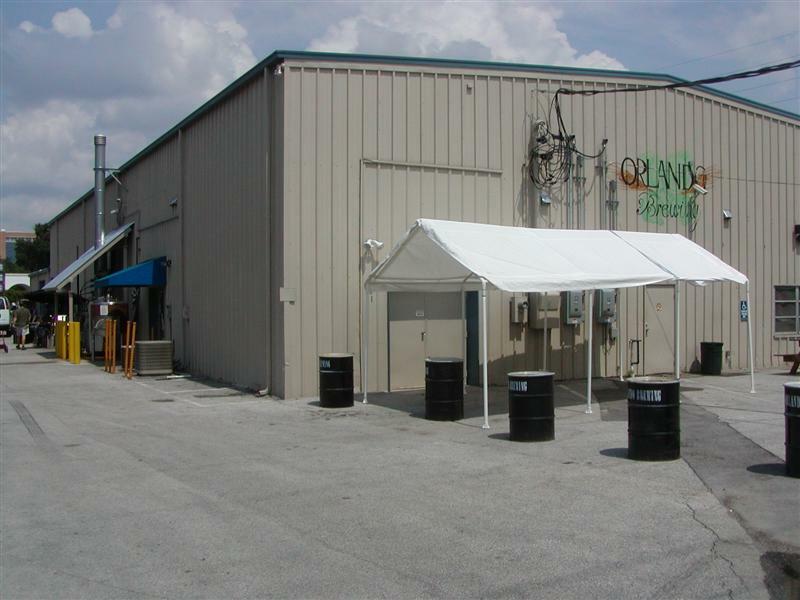 This place is located in a dingy industrial area near downtown Orlando. I was very easy to get to from Interstate 4. The place is very clean and has a nice atmosphere. The staff was friendly and knowledgeable. They have a very good selection of hand crafted beers. I had the sampler. All were very clean. I did not try the Wit as they use traditional phenolic yeast, which I do not like. I did not do the tour as they only run this at 6:00 and I could not stay till then. They have 7 of their styles in 6 packs for take away and they also offer growlers. They also offer some of their selections unfiltered. I enjoyed Orlando Brewing Partners, and would highly recommend this to anyone in the area. First the really good news - they now have food! OK, technically it is other people that have a German food trailer set up in their parking lot - there is probably no better food to go with beer than German food. And the German food is REALLY good. I was amazed at their selection - 16 of their beers and about 8 others, including Chimay. I enjoyed all of the beers I tried (9 via samplers). The Maibock was probably my favorite, though. They do have happy hour 3-6 pm every day, when all of their beers are on sale for $3 (normally $4-5). If I lived in the area, I would spend a LOT of time there. They do have growlers and bottles available to go, but neither are pasteurized, so they need to be kept cold. I really like the fact that they don't pasteurize it, but you just need to make provisions to keep it cold. Just to add a few details. This is a great local brewery stop. 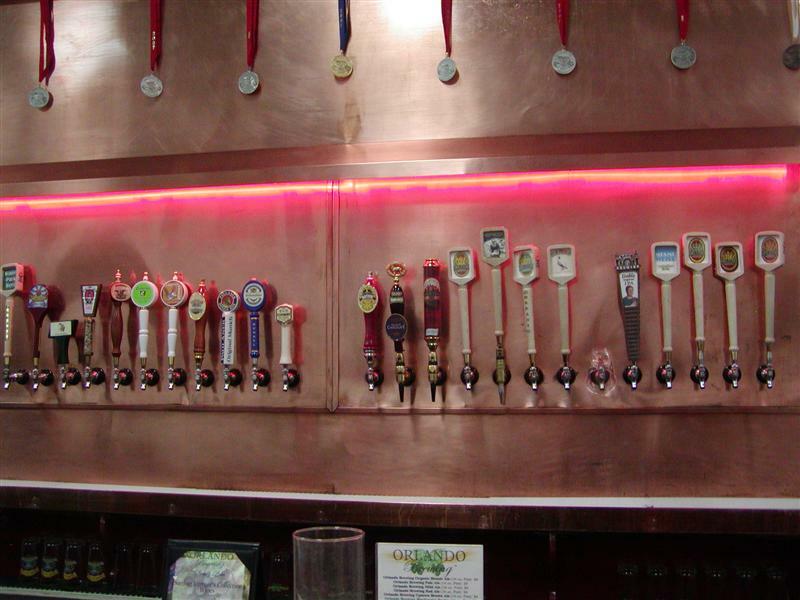 23 taps of which 9-10 are Orlando BP's own. 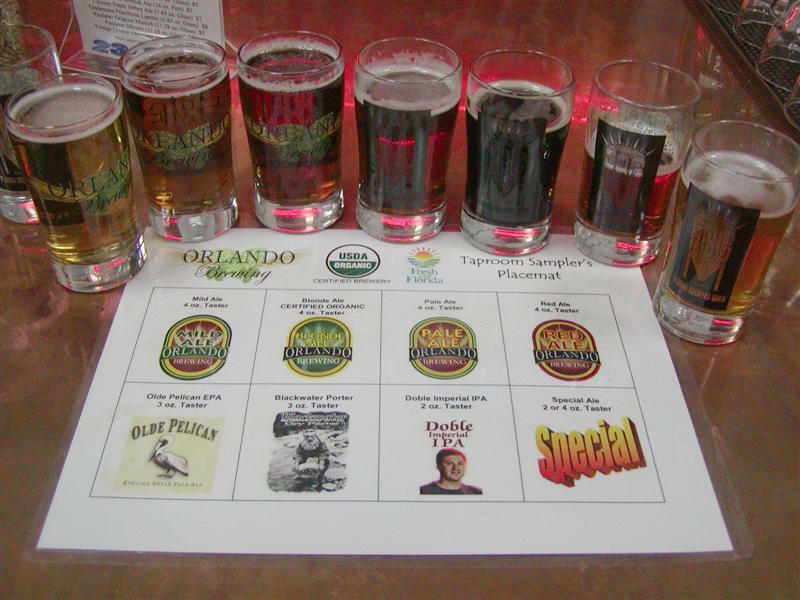 The rest are a fair selection of micros from other (non-FL) locations as well as a couple of their contract brews. I really liked the Doble IIPA and Blackwater Porter. Nice, friendly service. Didn't see the outside seating but there are tables and a nice bar inside. WIFI is available and they will host special events. No food is served for drop-in tasters. Check their website for open hours. My Wife and I decided to take a drive on Easter Sunday and wound up at the O-Brew. We were pleasantly surprised! Our first thought - (remember it is Easter Sunday) was is it closed? Fourtunatly, for us it was open. Getting in - was an experience. Guarding the door was the Owner's security guard named "Tracker", a very big and exceptionally friendy Black Lab mix. He stood in front of us determining if we were fit to enter? I was afraid he was going to run off, but no he was there just to greet us. :-) Our second thought was, "Wow" this place is huge and they have a great selection! Since this was our first trip, we went with the sampler, and truely enjoyed all of them. I must say the brews are all very good, but this time my favorite was the Pale Ale! We took a little brown jug home with us and plan to sample some more! We are looking forward to going back and trying more flavors! The Orlando Brewery knows Beer and we are proud to be patrons!